The Deimos features many smart technology features that continue to lead the industry, such as electromechanical microswitches that control the end of stroke, an incorporated two-channel rolling code radio receiver, and a self contained control unit with self-learning & self-diagnostic functions that is also compatible with the EELink protocol. 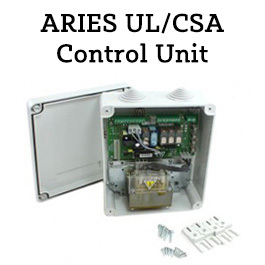 This unit, powered at 24V, has been specially designed for simpler and faster installation in compliance with the latest safety standards. 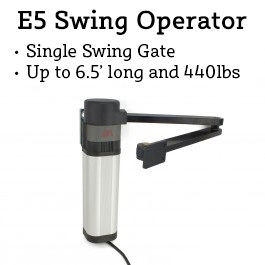 Thanks to the units obstruction sensing device, the gate operator reverses motion and prevents damage to people and vehicles in the event of detecting contact. Many features of the Deimos make installation and operation simpler than ever. 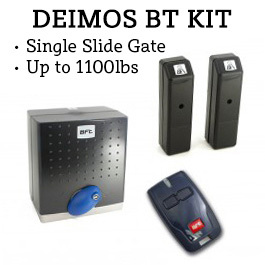 The Deimos slide gate opener has an incorporated control board (meaning you don't have to buy one separately) positioned right on front for easy accessibility. 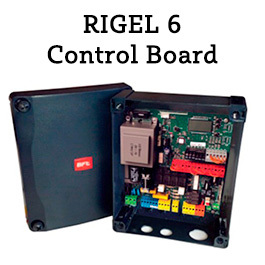 This control unit can easily be programmed using the LCD display. 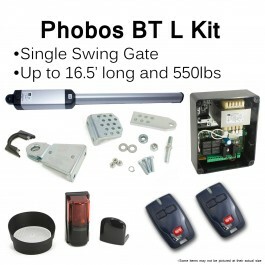 To make your gate operation continue smoothly during power outages, an optional battery back-up unit (P125002) can be fitted directly within the operator casing. This smart battery backup system will charge the batteries while power is supplied, and once a power loss is detected it will switch over to emergency battery power. Never worry about a power outage again! 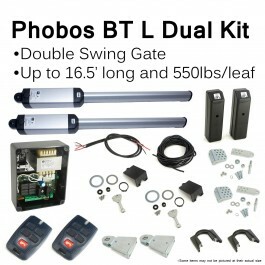 It's never been easier to upgrade your gate operator by powering it through solar energy. We have a complete solar powered kit that will upgrade your system to run off of the free energy of the sun, saving you on your energy bill month after month. These ECOSOL solar powered systems can easily be upgraded. You can upgrade the battery capacity by simpling attaching a double battery expansion kit, or you can increase the charge rate by adding additional solar panels.